Can I view a lot in person? Yes, we would always recommend that you view in person where possible. You can attend one of our public viewing days (click here for dates) or alternatively arrange a private viewing. Please contact us on +44 (0)20 7670 2932 to arrange an appointment. Brompton’s specialists are always on hand to discuss any questions you might have. Condition reports are also available upon request. How can I increase my bid limit? Your bid limit can be found underneath the search bar at the top of the online catalogue. A bid limit of £5,000 is assigned to all new bidders. To increase this limit, simply click on the link ‘Increase my bid limit’ at the top of the catalogue page and follow the on-screen instructions. What is the latest time that I can register to bid? We encourage all bidders to register at least 24 hours prior to the sale closing. However, you can register at any point while the sale is active. Please note: all new bidders will have a bid limit of £5,000. To increase this limit, you will need supply additional details to Brompton’s which can take time to process, thus we recommend doing this well in advance of the sale closing. I have placed a bid at the asking price but it says 'Reserve not met', what does this mean? If you have placed a bid that does not meet the reserve price, you will see the following icon on the lot page. This means that even if you are the highest bidder, when the countdown ends you will not win the lot as your bid is not high enough to meet the reserve. 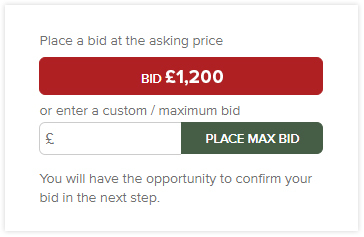 To change this you will need to increase your bid to meet the reserve and can do so via the 'Place Max Bid' option as seen below. The current asking price will then jump to the reserve price as long as your max bid is high enough. As other people then bid, the system will place a bid for you at the next increment, and will continue to do so until your maximum bid is exceeded. At this point you will be notified that you have been outbid and you will need to increase your bid if you wish to win the lot. Once the reserve is met, you will see the following icon. The Buyer's Premium is subject to VAT (value added tax) currently at 20%. For more information and example calculations, please click here. The Buyer’s Premium is an additional sum of 20% added to the final sale (hammer) price. Please bear in mind that the Buyer's Premium is subject to VAT (value added tax) currently at 20%. No. Once a bid is confirmed it cannot be cancelled. No, shipping is a separate charge. We encourage prospective buyers to request shipping estimates from their own carriers or from Brompton’s preferred shippers. Please see the ‘Shipping’ page for more details.